Although the Crusader may share the same faith as their Zakarum brethren, they are an altogether new breed of holy warrior. Rightfully so, the Crusaders deserve a set of skills all their own, one that reflects their resourcefulness, resilience, and (of course) religious fervor. 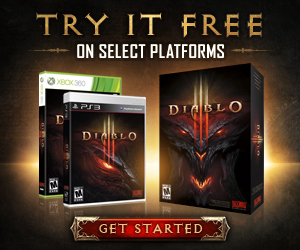 But how exactly does that happen in a game like Diablo III? Brace yourselves, nephalem, and get ready to explore the creative process behind concepting, designing, and implementing the mighty powers of our newest hero. Before diving into the development of the Crusader's skill set, there were some very important details that needed to be mapped out. These details were the class's core "pillars," or touchpoints that would serve as the inspiration and outline for the mechanical design of the class moving forward. To establish these pillars, the designers focused on the fantasy. When it came to the Crusader, one thing was clear right from the beginning: this was a big, badass melee hero who loves being in the middle of the action. Equally powerful was the idea that Crusaders are members of a holy order, possessing ranged abilities (spells) that can annihilate enemies from afar. The Crusader's power is holy and derived from the Light. They come from a martial order and therefore are never truly alone. Crusaders are tanks. They're not a traditional "tank," serving simply to absorb damage and redirect attention from other allies. Instead, the Crusaders are more like an actual war time tank (e.g. Panzer, Sherman, Abram), controlling the battlefield and their opponents through sheer force—and, of course, dealing plenty of damage along the way. Armed with these pillars, the system designers moved to the brainstorming phase of design. This phase included a number of different meetings as well as an open invitation to the team's designers, artists, engineers, programmers, and producers to share their ideas for Crusader skills, too. Everyone on the development team could participate in the ongoing brainstorm and no idea was considered too silly or too simple so long as it related back to the pillars. Ideas could come in the form of pictures, of a word or sentence, or some swanky combination of both! They could be entirely unique or reference existing imagery from a movie, television show, book, comic, or game. The High Heavens were the limit. 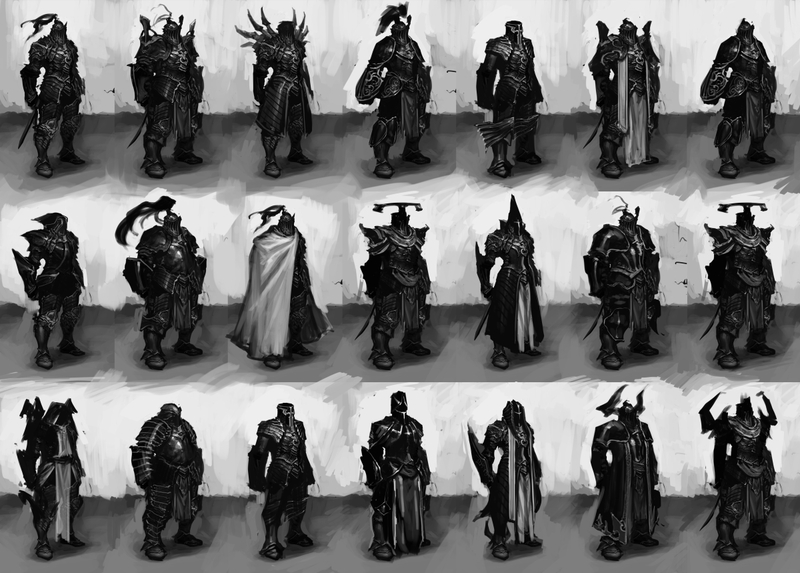 For the original five heroes, the goal of this phase was to generate a variety of different ideas that could then be distilled into three to five iconic skills for each class. With this kind of experience in skill building already established, however, the team decided to skip that particular step for the Crusader. Instead, they split the Crusader's skill list right down the middle, dedicated half its skills to melee and half to ranged attacks, and immediately started to translate different ideas from the brainstorm into something playable. Whether it was the image of a powerful warrior swinging a massive weapon and sending his enemies flying every which way like Sauron in Fellowship of the Ring (Sweep Attack), hurling a shield like Captain America and watching it ricochet between demonic skulls (Blessed Shield), or calling down the wrath of the heavens like Zeus himself (Heaven's Fury), brainstorming played a pivotal role in the creation of the Crusader skills you see today. After the brainstorm phase, the team moved into building out the Crusader's skill kit—or the entire complement of skills and runes that would accompany the class. This process included not only fleshing out the mechanics of the skills (i.e. how they work), but also what each skill would look like visually. There were a few skills that fell into place immediately. 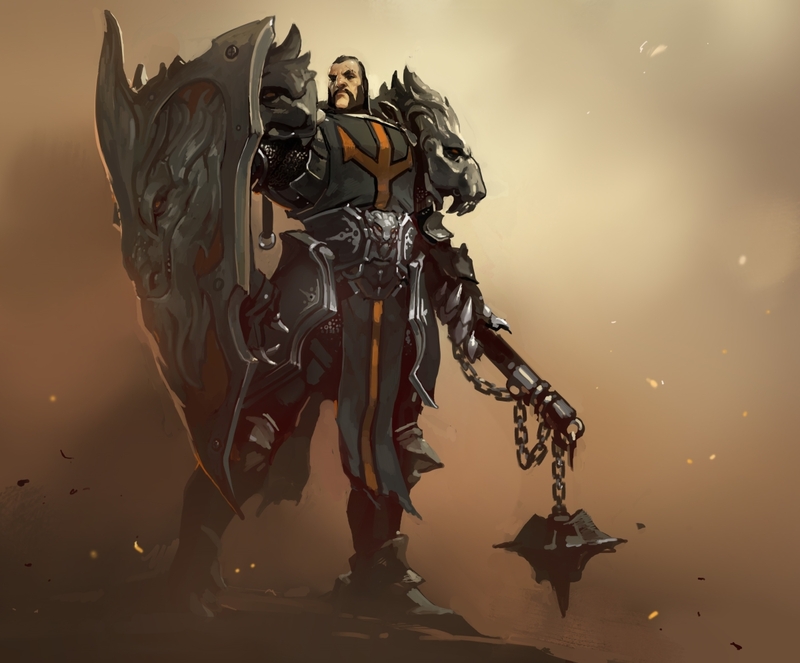 If you played Diablo II, it’s easy to see that there are several parallels between the Paladins of the past and these new Crusaders—and this is due largely to their shared heritage. Keeping that connection in mind, there was one truly iconic skill screaming to be brought forward, and it was Fist of the Heavens. Fist of the Heavens is actually the first skill in the Crusader kit to be completed, both in terms of the how the skill worked and its supporting art. It's a great example of a mid-range ability, one that allows the Crusader to stay in the heat of combat while taking out baddies just beyond the reach of his mighty weapons. In addition to Fist of Heavens, the Crusaders also possess another ability inherited from their Paladin forebears. This one has to do with hammers. Cue the trimuphant return of Blessed Hammer, the skill well known for summoning a mallet of pure divine force that circles its conjurer, laying waste to all that surrounds him. But why stop there? With Diablo III's extensive rune system, it had to be asked what more could be done with this exemplary skill. The Crusader flawlessly wields the power of the Light and it was important to play up this idea of him being a Holy conduit. 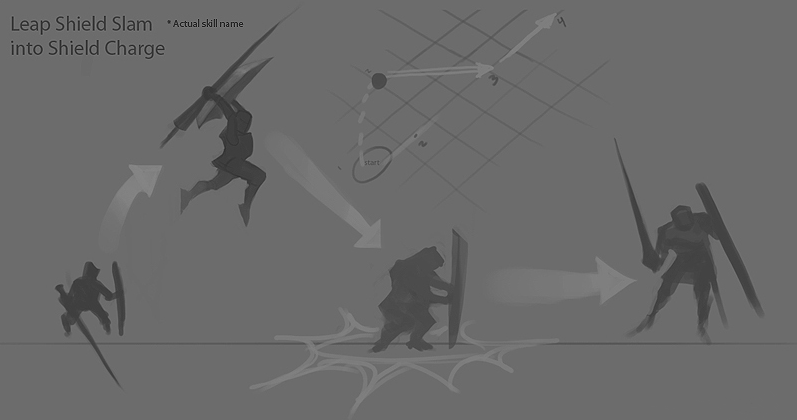 This lead to the creation of skill runes like Thunderstruck, which charges the hammers with lightning, and Dominion, which allows the hammers to orbit and protect the Crusader as he moves. The Crusader's movement skill was next in line, and the team knew it needed to be iconic. This was a simple matter, as a "knight in battle-scarred armor" would be nothing without his horse. And so Steed Charge was born. With this skill, the Crusader summons a celestial horse, and gallops around the battlefield at a fierce speed, charging into enemies as the player pleases. Aside from providing a considerable buff to movement speed, when equipped with the right runes, Steed Charge can also leave a trail of flames in its wake, heal the Crusader while active, and shackle any opponents who dare cross his path. Not all the skills in the Crusader's kit came quite so easily, though. Heaven's Fury is a great example of how an initial idea for a skill and its actual implementation can vary. As noted above, the concept for this skill started as the "hand of god" reaching down and smiting the Crusader’s enemies. While that sounded epic on paper, how exactly would it work in terms of gameplay? In its first implemention, players could direct the path of Heaven's Fury using a series of right clicks, causing beams of light to rain down destruction on the battlefield in snake-like patterns. This version was pretty cool visually, but it was insanely loud and, in a multiplayer game, had the potential to become wildly annoying. And so it was scrapped. Iteration began and the team landed on a version where the beam of light was channeled and would chase the player's mouse cursor around. This looked epic and felt really powerful, but it was a little rough mechanically. In addition, having a channeled skill for the Crusader just didn't feel right. In terms of design, the Crusader is a hero that should be constantly running around and hitting things, not standing idle on the battlefield. And so that was scrapped too. From here, the designers decided to give Heaven’s Fury its own AI, removing any need for players to manage the beam itself and freeing up their time to go smack something else in the face. This design also played into the initial idea of the skill being a "hand of god," or some kind of manifestation of the heavens that has its own will. This is the final version of Heaven’s Fury, which will unlock for all Crusaders at level 30 in Reaper of Souls. As you can see, it still captures that original idea of a Zeus-like bolt from the heavens discussed in the brainstorm, but also delivers a great gameplay experience (which is a paramount in a game like Diablo III). Adding these skills together results in an unyielding veteran of the battlefield. A dauntless warrior that charges fearlessly into combat, crushing foes with fire and steel. A war machine made human. A Crusader. We hope you've enjoyed this inside look at how the class's skills were created and iterated upon, and that you jump in on March 25th to experience the full arsenal yourself!